Combating misconceptions about firearms, and some other neat stuff too. At the request of commenter Angus McThag, I will do a (short) comparison of the 6.8 SPC loaded with the 85gr Barnes TSX to simulated M855 and M193 loads. I already whipped up a simulated M855 load in my previous post about 5.56 replacements, and I will be referring to that regularly through this article, instead of duplicating the information here. In addition, I will not be using Solidworks models for this estimate, as a reasonable estimate can be attained without doing so. As you can see, the peak pressure in this example is only 55,000 PSI, vs. the 58,000 PSI used in my last comparison. It is lower because 55,000 PSI is the maximum average pressure of 6.8 SPC according to SAAMI. If 58,000 PSI is used, the cartridge gains about 30 ft/s. The value of 2,770 ft/s sounded a bit low to me, and I thought maybe the Powley computer was giving me an incorrect result. However, when I adjusted the barrel length to 24" and checked it against Hodgdon's reloading data, I found that it was only about 41 ft/s lower than their value. 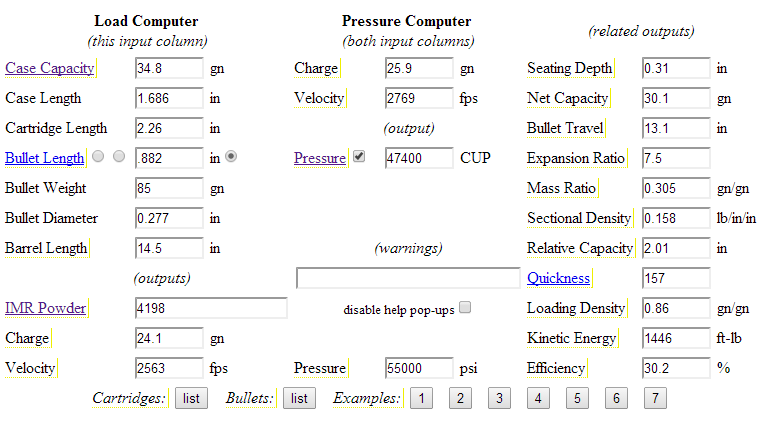 41 ft/s is definitely enough to make a difference in the performance of a cartridge, but it doesn't imply some kind of error in the computer itself (individual shots can often vary by more than 40 ft/s). For the same of comparison, I will continue to use the 2,770 ft/s value, instead of adjusting it, while noting that real-world values may be slightly higher. Just over 300 J at 500m? Jeeze, that's not that great. As we found in my last post on the subject, M855 produces over 400 J at that same range. Well, OK, but which cartridge weighs more? Your first clue is the weight of their respective bullets. 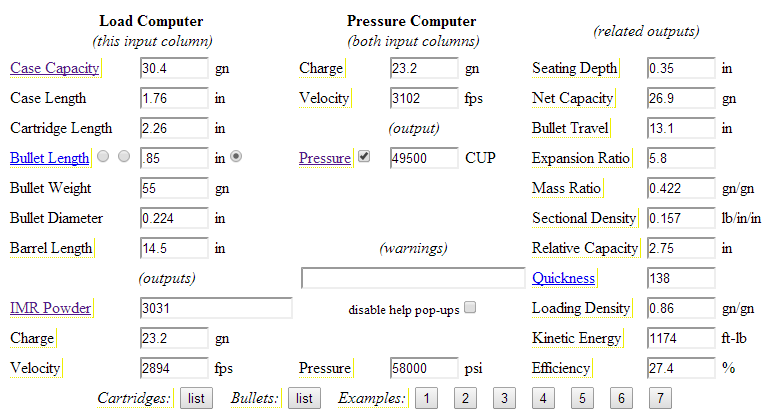 Having not rendered 6.8 SPC in Solidworks yet, I can't give you an exact figure, but using the weight from the 6.8 Tech Information page I linked earlier of 28 rounds of ammunition, I estimate that the 85gr 6.8 SPC loading would weigh over 15 grams. 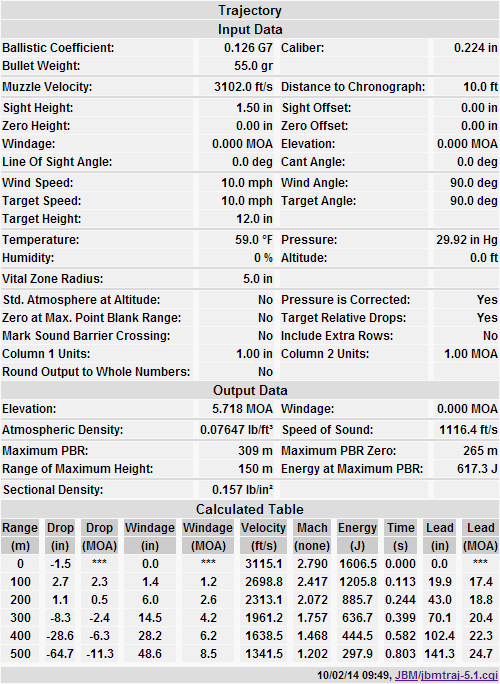 Given this, it compares pretty unfavorably to M855, producing only 20.5 J/g at 500m, compared to 35.5 for 5.56. It only provides 4% more energy at 500m. That's... Rather disappointing. We know that M193 has a cartridge weight of 11.5g, giving it approximately 25.9 J/g at 500m, a full 26% better than the 85gr TSX 6.8. The TSX definitely has the edge in bullet design from a terminal effects standpoint, but those ballistic results simply aren't very impressive. It gains almost 60 J at range from the extra 170 ft/s muzzle velocity, but it still doesn't compare very well to either 5.56, producing only 24.3 J/g at 500m. That's not great performance for a "best case scenario" of the lightweight 6.8mms. This article illustrates most clearly to me the value of high form factor, long ogive bullets. At the muzzle, the 6.8mm with lightweight bullets looks fairly impressive, but the poor form factors of those bullets really let it down after a half-kilometer. Even by 300m, the initial estimate for the TSX has fallen below M855 in terms of absolute energy, not to mention energy per pound. The 6.8mm cartridge leaves even less space than 5.56 for long ogive, slender bullets, and I think this is the key to understanding its fairly lackluster performance with low sectional density bullets.